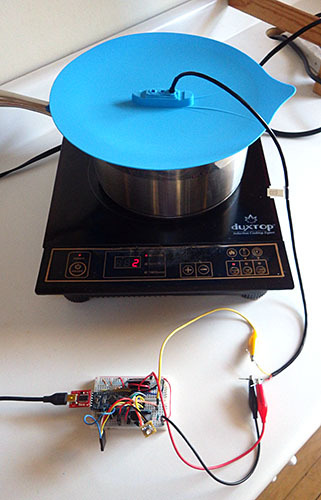 DS18B20 1-Wire calibration with Arduino: Finally nailed it! 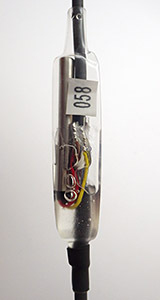 The Thermapen tip fits reasonably well into a 9/64″ hole, and that size also makes a good pilot hole for the 1/4 inch DS18 wells. The travel on my little bench-top drill press is only two inches, but that turned out to be the perfect depth. The whole job took about 4 hours, with less colorful language than I was expecting. The high residuals I was seeing up at 40°C, and the dubious waterproofing on those cheap DS18b20‘s convinced me that I needed a dry well for the calibrations. Since lead has a thermal conductivity 100x better than water, my first though was to populate a tin can with short lengths of copper pipe and fill the spaces in between from my solder pot. But I was unable to find exactly the right internal diameter of piping for the tight fit I wanted around those sensors, and the charts indicated that aluminum would give me 1/2 an order of magnitude more thermal distribution. So despite the fact that I had no experience working metal like this, I ordered a 4″ piece of lathe bar stock from eBay (~$15). Go to a 530GPH pump if you have a larger water bath. The aluminum and stainless steel contact point suffered a bit of galvanic corrosion at first, but I separated them with a plastic plate and it seemed fine after that. It took me a while figuring out how to lubricate the bits: basically you can never have too much cutting fluid at small diameters, but you can use the big 1/4″ bits ‘dry’ once the pilot holes are in. Just lift the bits frequently to clear the shavings so things don’t heat up and bind. 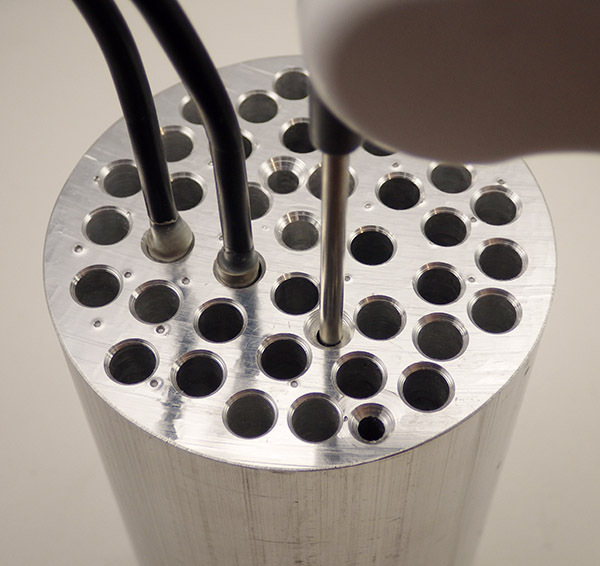 And yes, new high-temp drill bits will cost you more than the aluminum rod – but it’s worth it. 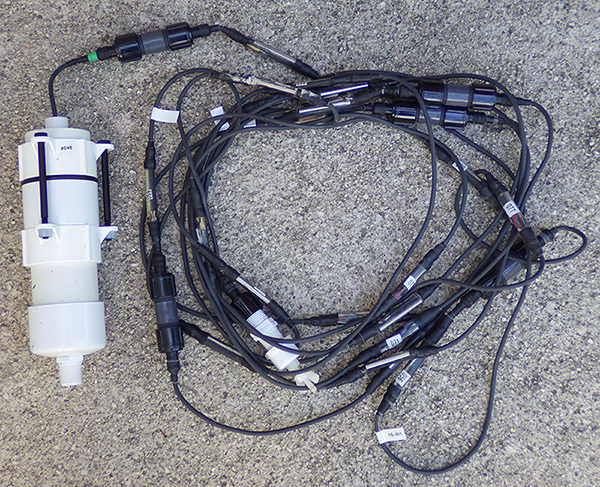 The 3″ diameter rod gave me enough room for 38 DS18’s with a few different locations for the Reference Thermapen probe. The next addition to the process was a 1200L/h aquarium pump (~$8), which created a vigorous circulation in the five liter reservoir. 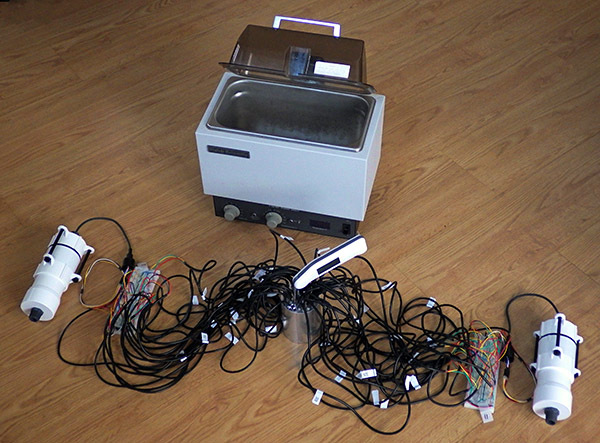 So now I have a setup were the clunky old water bath provides a big lump of passively cooling thermal mass, while the sensors and my reference thermometer are held together by the conductivity of the aluminum block. 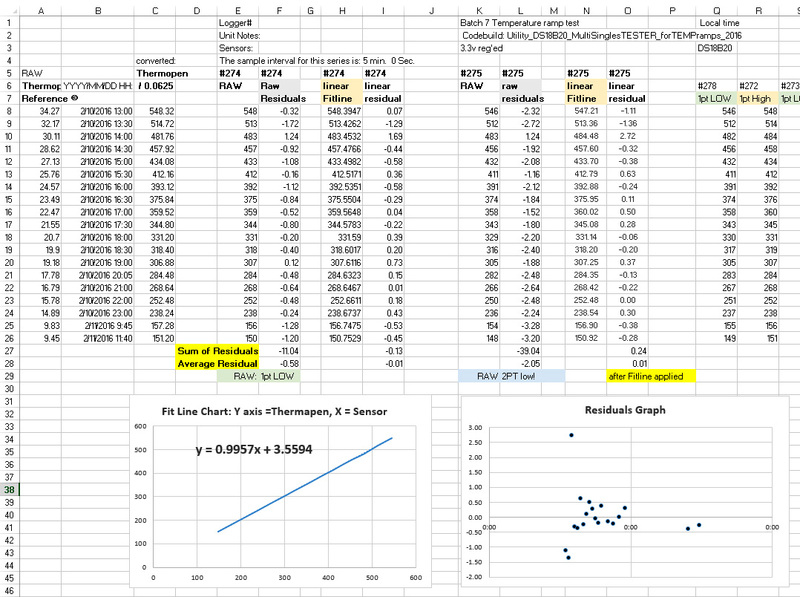 After removing the bad reference readings I generated the same series of y=mx+b fit equations as before, only this time I did not use a graph trend line to generate the constants (described in the previous post) but instead used the slope & intercept functions in excel. This lets you copy and paste the equations from one data set to the next with a macro, dramatically speeding up the process when you are chugging through more than thirty sensors at a time. It also adjusts & recalculates dynamically when you delete a row. It’s quite an improvement to be able to use the DS18 output to polish the set because in previous tests (without the dry well) the high temperature residuals were so variable that it would have completely masked this kind of problem. 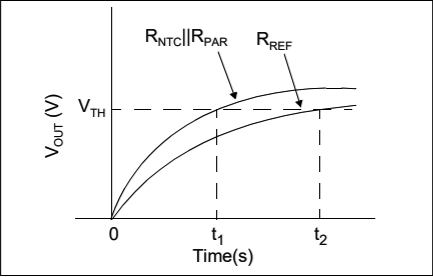 With LSB points on the y axis of those graphs, the corrected residuals for a good sensor fall into a tight band between ±0.5 LSB. The bad sensor on the right has a huge spread, and was immediately tossed in the garbage. 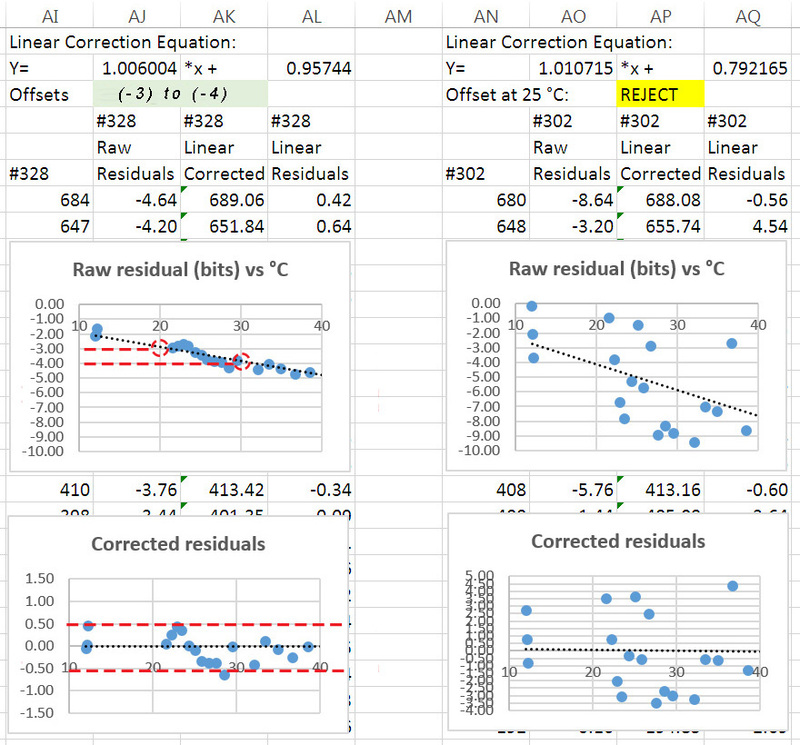 In theory at least, I’m achieving calibration accuracy better than the sensor resolution of ±0.0625°C. It would be a bit bravo to claim that, but I am confident that we reached the ±0.1°C target that I wanted for our field sensors, without doing a full laboratory level temperature sweep. Another benefit of all this work is that I can now group my sensors using the raw residual trend-line values at both 20 & 30°C. (see top left graph for #328 above) This captures both the offset and the slope information, and by matching slopes I can assemble strings of sensors who’s uncorrected behavior does not diverge. With the calibration corrections already in hand this might seem unnecessary, but experience has shown that being able to quickly spot trends in the raw data can be very handy in the field when you need to make on-the-spot decisions about a deployment. 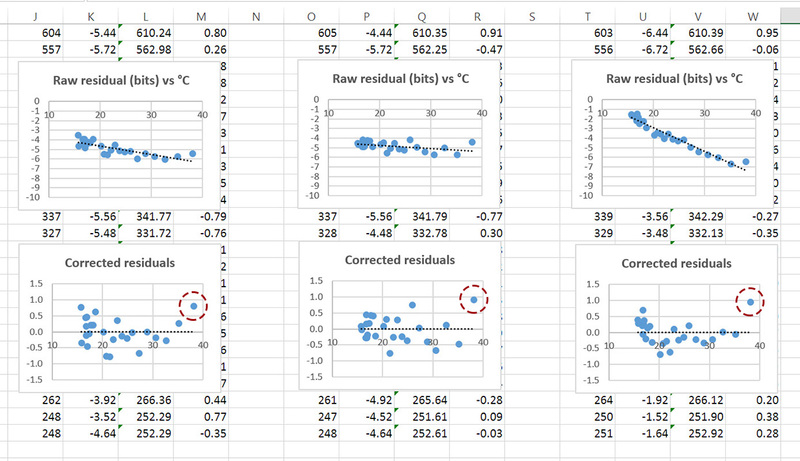 I can also add that the sensors from different suppliers showed strong clustering in these groups, implying that production run biases would introduce an offset into group normalization methods (ie: without a reference thermometer to compare them to) unless you bought them from several sources. Of course these guys still have to prove they can last a year under water, so for now we will continue with dual deployments (which we usually use for new prototypes) in case one drops out on us. I’ve only got solid power usage data from one of my 24 sensor chains at the moment as everything else is still out on deployment. On those early units, I had no idea what the total usage would be so I just packed in 12 AA’s. 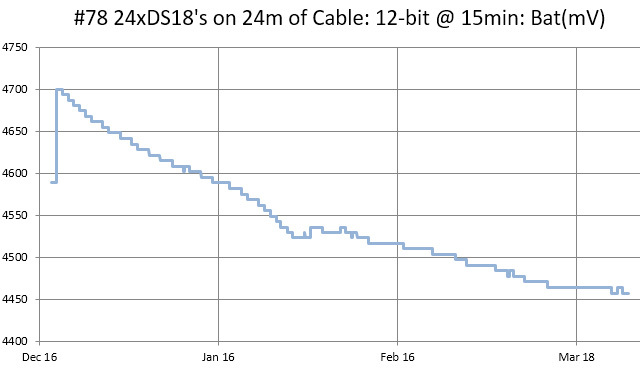 (4 banks x 3 in series) After the over-voltage burn down, the discharge curve settled to a steady 100mV drop per month. That unit had 24 sensors, taking 12-bit samples every 15 minutes. My current builds have only 2x 3AA banks, so I expect them to drop by about 200 mV per month. A low input cutoff of about 3.4v on the regulator means that I will probably get 5-6 months out of a fresh set of six AA’s. Driving the DS18’s at their maximum resolution (ie: 24 x 1.5mA x 750ms =~27 mAs /sample), I think we would only make a year on 3AA’s if I moved the interval out to once per hour. With respect to quality, the real test will come in post deployment testing when we find out how much these sensors drift over time. And I am really keen to see how the units we deployed across that hydrogen sulfide layer performed, as that chemistry is far from benign. If they prove hardy enough, we might even bury a few and see how that goes. 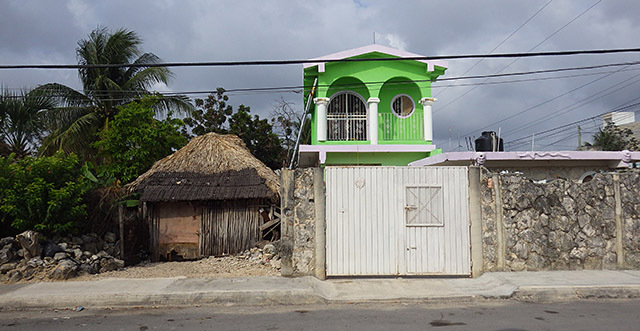 In harsh environments, every choice you make in the build is a cost/time-to-failure trade-off. You can see how closely matching the 20 & 30°C offsets groups the raw readings into a fairly tight 3-point band even though the sensors are now distributed around the water bath. 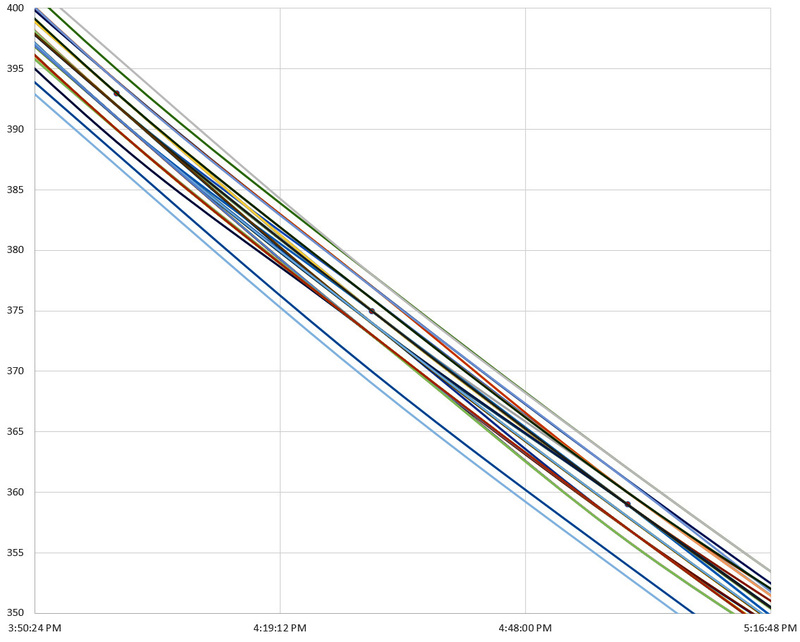 Applying the linear correction reduces that to 2pts, and shifts them all up towards true temp. With the spread approaching the bit-toggling level I suspect I’ve reached the point of diminishing returns, so I’m calling this set ready to deploy without further normalization. This second Y=mx+b correction is based on the average of the post calibration readings (so should have no effect on the accuracy) and you can still see some spaghetti squiggles from the inherent noise in these b-class sensors. I was hoping that the new method would save me from having to bang ’em together like that, but apparently it depends on how fiercely you apply your selection criterion before getting out the epoxy. Now that I have several more of these temp. chain loggers under my belt, another issue has popped up that could be taken care of easily at the calibration stage: Sleep current. Sensors from some of the eBay vendors draw significantly more than the 750nA standby listed in the spec sheet. A ‘good’ set of DS18B’s doesn’t add significantly to your loggers sleep current, but a couple of lemons in the batch can raise a 12-node segment to between 0.1-0.2 mA for the sensors alone. This might explain how these cheapies get onto the grey market in the first place. What’s twisting my melon is that it’s hard to know how much of the post-cal normalization is actually beneficial, and how much of it is just compensating for differences in water bath, since the post epoxy sensors are no longer pinned together by that block of aluminum…? 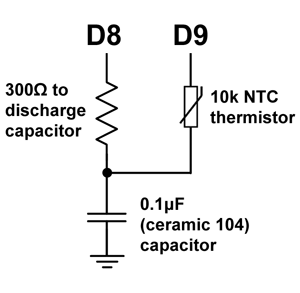 Just a quick note to suggest another step to overall procedure: Measure the sleep current of your DS18b20! Good ones auto-sleep at about 1μA, but I’ve had a few batches now that constantly draw between 40-60 uA each. This flaw was definitely vendor specific, so only buy a dozen or so from each to test them out before buying a large bunch. So far, I’ve had the best sleep currents with the $2.50 sensors from electrodragon, though their “waterproof” epoxy job is utterly pathetic, and the raw 20 & 30°C offsets are often just barely within the ±0.5°C spec. Also I have modified the script I use to gather the serial numbers so that it automatically sets the sensors to 12 bit every time it runs. That is the default resolution, but I found that one or two sensors from a given batch arrive set for lower bit depths. And finally, watch out for sensors that require parasite power turned on at the end of the conversion to operate properly even when they are being powered by all three lines. 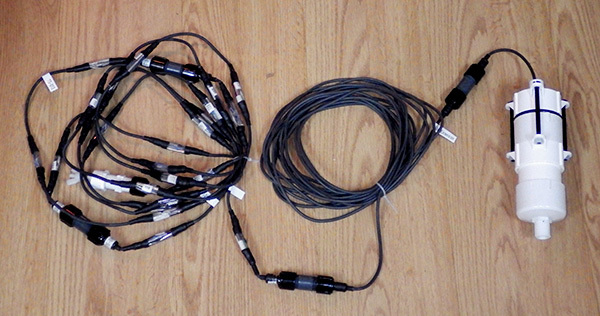 (ie: needing oneWire.write(0x44 ,1); rather than oneWire.write(0x44); ) I have never gotten parasite and normal mode DS18b20s to work properly as a mixed bunch. Stick with normal mode. Usually I do these calibration runs with sets of 32-34 sensors, so all the holes in the aluminum block are filled. But I recently tried to calibrate a small batch of eight “naked” DS18b20s with the same method, and ended up with slope and offset calibration factors that were 1-2 degrees Celsius too low, as compared to my reference. I re-ran the cooling ramp with tape over the unused holes, and sure enough, the adjustments became much smaller, with the raw readings much closer to the reference. Air was getting in and cooling the center of the block where the sensors were. So if you use this method on a smaller numbers, use other DS18’s to plug up all the unused holes, and put tape over the used ones to prevent air circulation from depressing the readings for raw sensors. I hadn’t thought about it earlier, but the sensors themselves form part of the thermal mass of the system. 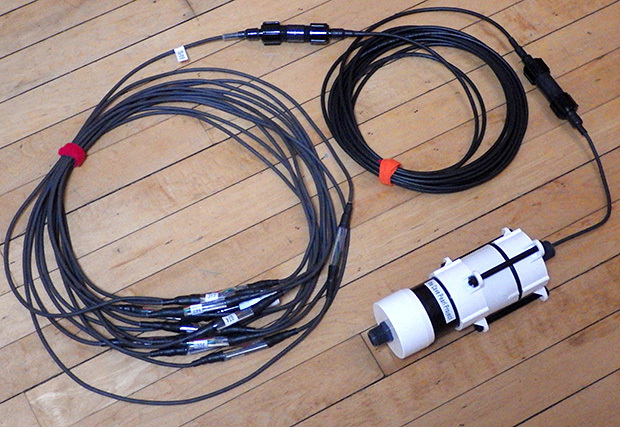 Once you start calibrating, you will have more than enough ‘duds’ (with the cables cut off) to plug up those wells when doing a runs with smaller numbers of sensors. I just stumbled across a paper at MIT that makes it pretty clear that I’ve been reproducing a standard method already on the books. I’m still digesting the information, and there is lots of stuff in there about handling sensor frequency issues, but I figure most of that has been damped out by the oversampling in the DS18, and by the epoxy around the sensor nodes. Shower combs from the local dollar-store worked well to keep the sensors separated. We retired a few early generation temp. strings during the last round of fieldwork, and many of those had been deployed before I had a good calibration process. But we had months of data from them, so I now had the challenge of calibrating these sensors after the strings has been assembled. With 24 sensors per chain, they amounted to pretty hefty lump, and it would take some work to make sure they were all exposed to the circulating water bath properly. Some large combs provided the needed separation, and I mounted a 330Gph circulation pump near the center of the mass. So now I could use the waters cooling curve to do a decent normalization, but calibration with the was going to be tricky because of the thermal inertia of the epoxy around those sensors. I found a dead sensor from one of my early experiments, and drilled it out as a mount for the Reference Thermapen probe, providing it with approximately the same amount of lag as the sensors on the strings. The loggers recorded readings every 5min over 24 hours, for the group normalization (y=mx+b) coefficients . I did manual readings with the Thermapen every 30minutes which provided at least one reading per degree as the bath dropped from 35°C to 20°C. 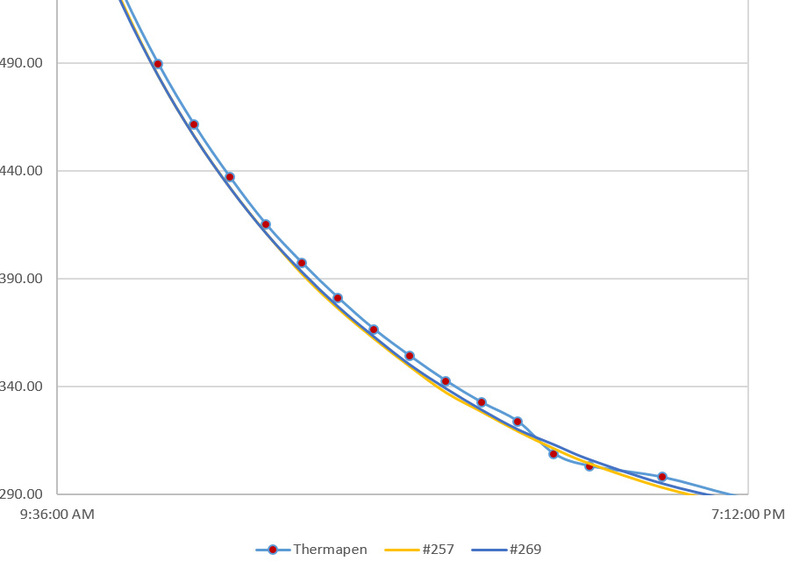 For that T-pen subset, I produced a second set of y=mx+b coefficients that corrected the group average used for normalization, into the reference temps. So the order of operations is reversed when compared to procedures that start with calibration of the raw DS18b20’s, but I’m happy to report that the process worked rather well, turning some jagged old data sets into smooth temperature profiles that compare very well to Hydrolab drop profiles from those same sites. In fact it worked so well, that I think I will do it with every chain that comes home, with a careful eye on the chains that had a decent calibration as individual sensors. I’ve seen plenty of pressure related problems in my other temp sensors, so I do wonder if the contraction of the epoxy is enough to hurt those initial calibrations? Just noticed a nice DIY dry bath over at instructables.com. Though I’m not sure its accurate enough for calibration, you could still use it on the “natural cooling curve” side like I do with my wet/dry method. I’m sure there will be more good calibration kit coming out of the bio-hacking boys soon and they did some beautiful DS18b20 calibrations over at http://www.kandrsmith.org using the melt plateau of 99.99% gallium. 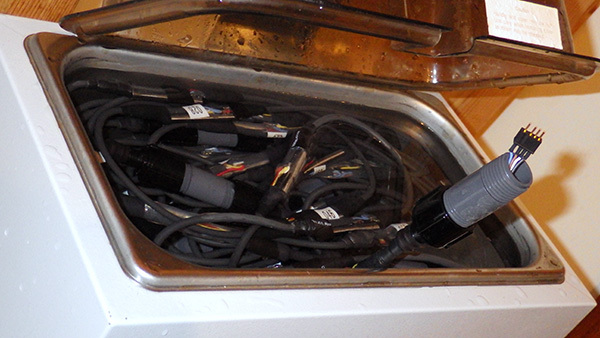 And here’s an interesting “exposed” epoxy mounting of DS18b20’s in a liquid-cooled system. This entry was posted in Developing a TEMP ℃ chain on March 5, 2016 by edmallon. Without the dryer lint stuck in the end, the last digit on the Thermapen sometimes does not settle. I use the same thermometer for individual sensor calibration later on, but in that case it’s the DS18B20 probe that moves in and out of the copper sleeve, while the Thermapen stays in the Calibration Bath most of the time. The somewhat annoying folding off/on feature of the Thermopen design forces you to take it out of the bath every 10 minutes as the unit times out. These sensors usually tend to have stable offsets to within 1 LSB, so they group together naturally into ‘bands’ of 2pt high, 1pt high, 1pt low, etc. although they tend to toggle up or down over the length of the curve. 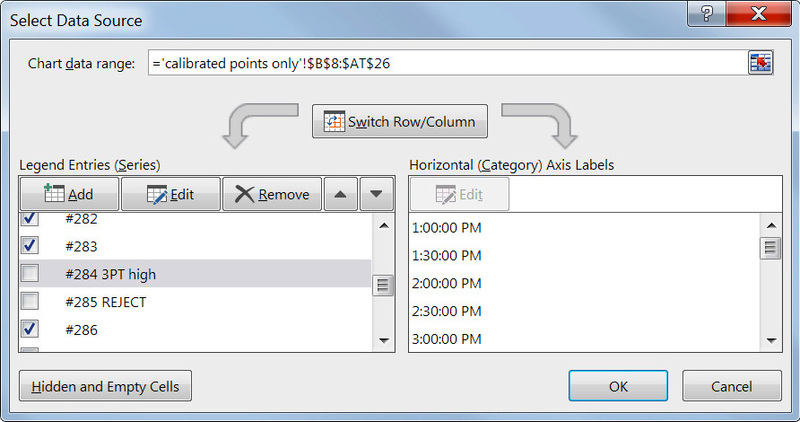 I right-click on the lines and label the nodes with their behavior in Excel. You can see here that some of the units that were 1pt low between 350-380 change over to 1pt high down around 300. And sometimes I move the sensors into a different bucket after looking a bit more closely at their behavior in Excel. Those are the raw 12-bit integer readings, so the graph above covers from 18.75 – 37.5°C, and over that range you typically get about half of your sensors toggling within one LSB of the reference, with a further subset of about 8-10 that lie right on the reference line. If I can live with a spread of ±2 LSB (ie: ±0.12°C), my yield from this batch of sensors goes up to 31 out of the original 43. Given that these guys cost about $2.50 each, I just toss the rest into the bin before I do any further calibration. Occasionally, I get a bad batch where I triage around 50%. But the thing is, I invest so much time mounting these sensors, that I would still be doing a suite of tests like this no matter where I bought them. Time is the real cost when you build a logger with so many sensors connected to it. If you want to do more than just eyeballing those graphs, a simple first pass is to subtract the RAW sensor reading from the 12-bit equivalent of your reference reading. Then take the average of those residuals as your bin category. (excluding high temperature outliers) This is still a pretty broad brush approximation of your sensor behavior though. Note: The spreadsheet above (Click to embiggen) is in sensor output equivalent numbers rather than Celsius or Fahrenheit. It’s just faster to translate the reference data into sensor equivalent units, rather than change all the other numbers in the spreadsheet into stanard temperatures. But the units you decide to use does not change the method, just the constants you get for your trend-line equation. 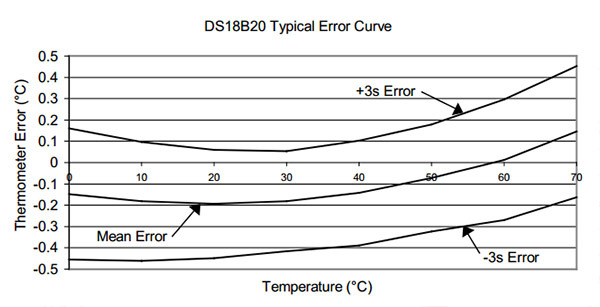 Since the 20-30°C range is usually the flattest part of the DS18b20 response curve, a linear trend-line usually brings my average residuals below the sensors LSB resolution of 0.0625°C. In essence, this is a simple multi point calibration method that you could do with any reference thermometer and an insulated bucket of warm water. If you have to go to a polynomial to get your residuals down in this temp range, you probably have a sensor that is going to be a pain in the backside to deal with. I always have bigger residuals at 30-40°C than I do at 20-30°C but that is also the part of the curve where the bath is cooling more quickly, so I suspect that I have hot and cold spots cropping up in the physical system. I’m now looking at adding a circulation pump, and perhaps making a dry well insert to put in the center of the bath. This cooling ‘temperature ramp’ procedure is much different from the two point calibrations I was doing earlier, and I am still trying to determine which one gives better results when I combine it with the normalization that I usually apply to these sensor strings after they are epoxied into permanent sets. So far, the actual measured ice point offsets have not been agreeing very well with the intercepts predicted by regression on data from 20-30°C and that has me wondering whether it’s even worth the effort to calibrate these sensors over a temperature range that they won’t see in the field. For the ‘normalization’, I repeat the cooling water bath procedure above with the completed temperature chains assembled as they will be for a deployment. But instead of the Thermapen readings, I use the corrected average (using the equations from above) of all the sensor readings on the Y axis, to generate a second correction equation to apply to each sensors raw data to normalize them to each other. Unlike Craig at Yosemite Foothills, I use a second order polynomial for on this step. After that second correction is applied, any differences I see between sensors on the same chain should only be due only to a real differences in temperature. Well it serves me right for counting my chickens. After a few more days putting these sensors through their paces, 11 more units have died or they have stopped reading temperatures below 15°C. I’ve been drying them on the radiators each night, and though we have a hot water system, I suspect the combination of daily soaking, and night time roasting, loosened the seals between the metal caps and the epoxy or did some other kind of damage. 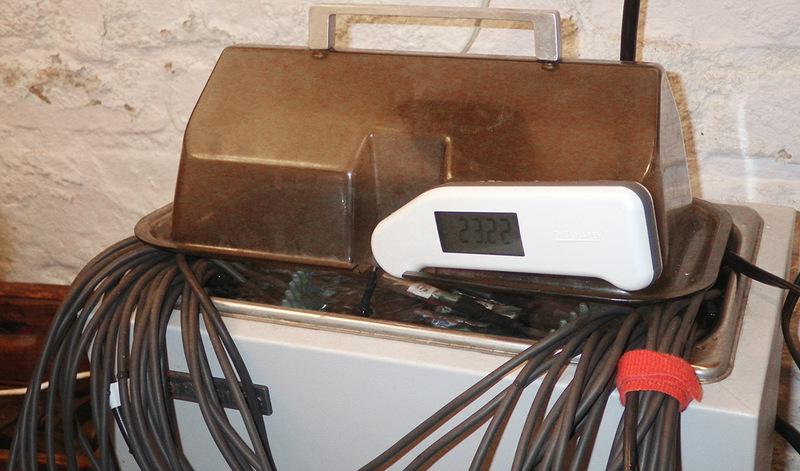 So now this latest batch is falling towards a 50% yield of sensors worth putting into the chain. Looking on the bright side, perhaps selecting sensors that can take more abuse is a good idea in the long run, even if it was done accidentally. An air filled unit from eBay vendor nyplatform. Looking on the bright side, it’s very easy to extract the raw sensor if you wanted to. 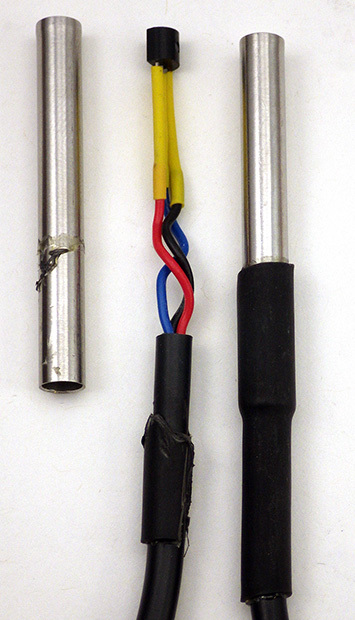 Though the units from Electrodragon had at least some epoxy inside, they were still easy to simply pull away from the stainless sheath, and when I did that I discovered some nasty smelling chemistry going on in there. The frustrating thing about this is that during calibration runs these sensors were by far the best performers in terms of offsets & accuracy. But after seeing inside I have to wonder how long they are going to last. I have started pulling all of these units out of the metal and cleaning them with 90% IPA so that I can mount them directly inside the epoxy. Hopefully this treatment will halt that creeping decay and keep them running longer than they would have if I just left them as they were. DS18b20 after cleaning & embedding in epoxy. So I guess the take home of all this is that these cheap sensors should only be considered notionally waterproof in the same way that the round red things you buy at the supermarket in the middle of February are notionally tomatoes. Of course, once I strip them from the casing, they could be subjected to more pressure at depth, which had bad effects on my other temp sensors…Argh! Great Work, I’ve a question if you don’t mind. 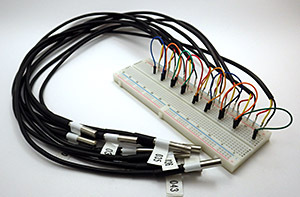 The length of probes DS18B20 are small and several times I had to make extensions, used single-wire cable (Ethernet cable), sometimes the probes stop to work as the union between cables is made with solder, did this ever happened to you? if I just wrap the wire to the other and put duct tape around works well but is not as solid. I solder everything, and so far I have not had any problems with signal bounce on chains up to 25 m in length. 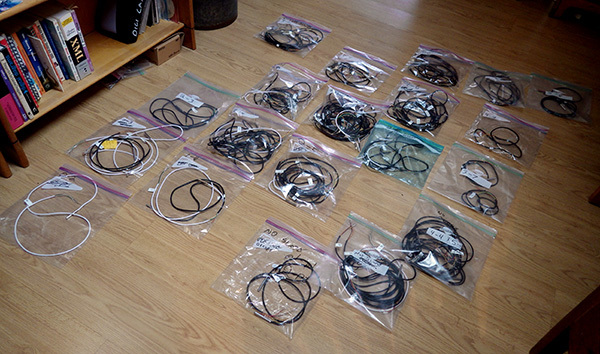 But I do not use Ethernet cable, I use M12C Series Extension Cables from Omega.com as these are rugged enough for my underwater application. However I should mention that I have ruined several sensors in the past by having my soldering iron too hot when I tried to put the jumpers on the legs of naked DS18b20’s. I simply cooked them by taking too long. 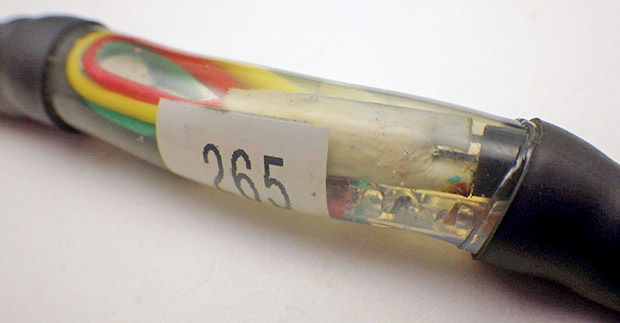 Wire wrapping could work if your leads were clean, but it takes practice, and a good tool for the job. 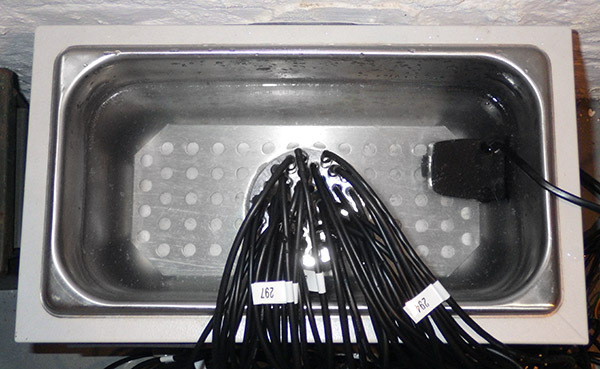 Generally I buy the waterproof units that already have 1-2m of wires connected (as pictured in the post above) since I need at at least short term waterproof capability to run the sensors through the overall calibration procedure before soldering them into a chain. This entry was posted in Developing a TEMP ℃ chain on February 12, 2016 by edmallon. 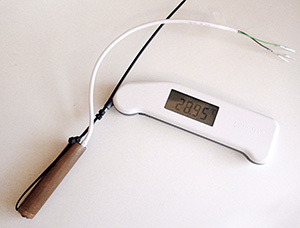 Although both of the alpha loggers passed the overnight tests following their first run, the shorter (25cm) chain developed a reading problem as soon as it was powered up. The fact that this error occurred before the unit went near the water tells me that it was either a sensor failure, or a problem with the connectors. I have been using Deans 1241 micro connectors between the segments because they seem really robust, but my gut tells me those break points could also add some signal reflection problems. 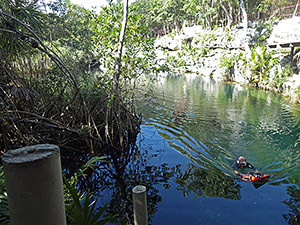 We went hunting for potential deployment locations by dangling a 24m chain from a life jacket and moving it around the cenotes to generate profiles. I think I will put a display screen on one of the next units to make these ‘prospecting’ trips easier in the future. The logger itself ran for the duration, but the log data was a string of the dreaded 85C (ie: 1360) and ‘-1’ read errors. Since these numbers are fairly distinctive, I will put an error check in code on startup to see if I can intercept this kind of problem in the future. At least the pressure record from the MS5803 on the housing survived intact, and that sensor seems to be working again now that I have removed the Qsil silicone coating that I had over top of the sensor on the previous deployments. I isolated the read fault to the first segment of the temperature sensor chain, and when that section was removed the rest of the sensors ran well enough. We decided to re-deploy the parts that were still running (although the chain is now less than four meters long) and I brought the dodgy section home for some forensic testing. I am suspicious of the U-09LV urethane that I used on a few of the nodes, thinking that it’s higher moisture resistance might not compensate for the stiffness and overall durability of E-30CL. Even with relatively long 50 cm spacing, the large rain events of the season pushed the fresh/salt boundary around so much that several sensors (indicated here with 48pt moving averages) switched from the saline, to the fresh water, and then back again. It will be interesting to see if those bands tighten up, or spread out, after we apply our normalization factors. This 6m x 24node chain has a 10m extension, allowing us to change sensor positions in the water column by simply tying off the excess. After several meetings to obtain permission from the landowners, we managed to install our new set of DS18b20 temperature strings. We decided to co-deploy a combination of high and low spatial resolution chains, so that we still have a good chance to get data, if one loggers dies. Due to memory limitations, etc. I built them with twenty four sensor nodes per logger, and even with those spread out over 24m of cable, 3k3 pullup resistors are enough for the one wire communications. That’s aggressive enough to give me some concern about self-heating if I was doing multiple readings, but I figure that with the bus at 3.3v it probably just comes out in the wash. This deployment site had significant amounts of hydrogen sulfide at depth which forms a visible layer that is shown well by these photos from Angelita. It will be interesting to see how the chemistry affects our sensors. It certainly had an effect on me, as I was a little worse for wear after that dive. This entry was posted in Developing a TEMP ℃ chain, Expedition Reports & Updates on January 10, 2016 by edmallon. 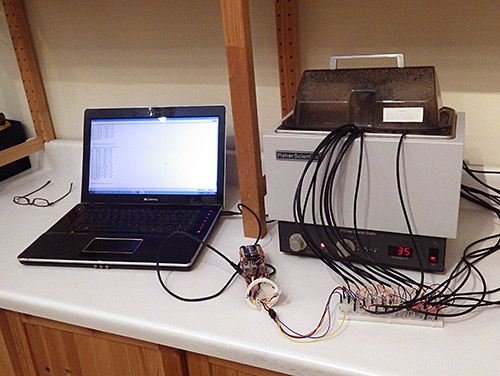 Field Report 2015-08-12: Success with DS18B20 1-Wire Temperature Chains! Yep, that’s me grinning like a fool. It might not be an X-prize, but it worked! IT WORKED! We were already happy with the flow & drip sensor data from this trip because, despite the TMP102 problems, most of the units had performed brilliantly. But for me, the real prize of the season was going to come from the underwater temperature strings that began their first ‘real-world’ trials on the last trip. Because the cave they were in presented some challenges, we didn’t pull those units until we had a few good dives under our belts. Back in March, I had just changed over to slimmer builds in 2″ PVC pipe, and the flow meters at this site were the deepest deployment so far for those new housings. So every unit in this cave was testing something important, and I hoped to take plenty of photos despite the fact that we were right at our little cameras limit. That logger supported a fairly short 5m sensor chain, with 19 nodes spaced at 25cm. It was installed across the halocline, and I admit that I was concerned that (with a minimum increment of 0.06°C) those humble DS18B20’s would not have enough resolution to track the fresh/salt water interface. In addition, I had assembled the string in segments that were linked by my new diy underwater connectors, so these builds had more potential failure points than I even wanted to think about. 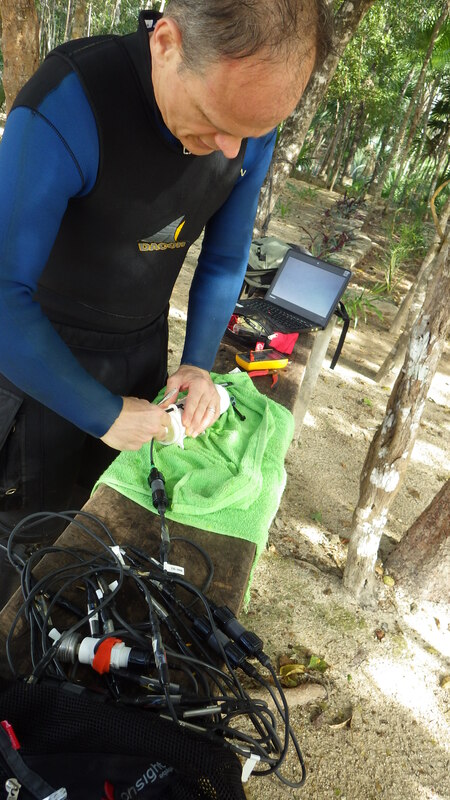 It’s probably a good thing that that our dive schedule was so full that I didn’t have time to look for LED heartbeat pips while we were still under water. Note: I inverted the temperature axis (left side) to match the physical situation: the saline water was warmer at depth, with a cooler fresh cap layer. The black traces are 96 point (1 day) moving averages. 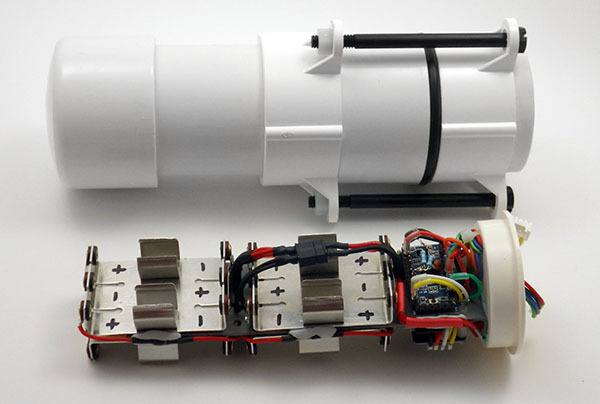 I knew those sensors were going to pull a substantial amount of juice during 12-bit conversions, but putting twelve AA batteries in the housing was still something of a shot in the dark for me back in March. While both curves looked smooth , there was something odd about #046 using less power than #045, because it had one more sensor (total of 20) and they were stretched out over 10 meters of cable so #046 also had a more aggressive pull-up resistor on the bus. A bit more poking around and I noticed that I had accidentally reversed a cell in one of the banks (those with sharp eyes probably spotted that in the photo above) so #045 had actually run on only three sets of AA batteries. Shottky’s isolate each bank against battery failures, but it’s nice to know that they also protect the little loggers from my own dumb mistakes. With 46’s full complement of 4x3AA batteries only loosing 0.5 v over almost four months, I’m confident these loggers could approach my one-year operating target on a fresh set. 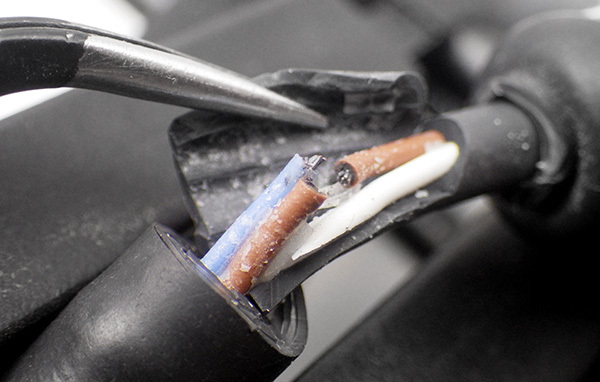 After four months under water the adhesive on that marine-grade heat shrink looked a bit flaky, but there is ECL30 potting the wires inside the adapter so I’m not worried about the seal. Of course that’s predicated on everything staying water-tight, so I examined each temperature sensor very carefully: looking for evidence of water damage. Most of the nodes were filled with hard epoxy (E-30CL), and for some I was trying out a more flexible urethane. (U-09LV ) They were all remarkably clean, with only one node showing yellowing, and that one was a botch where I had split the original sheathing under the heat gun, and had to re-wrap it. 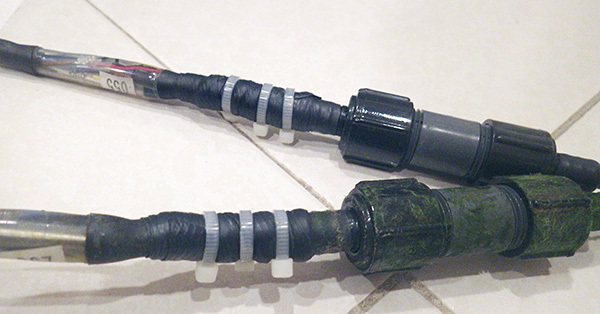 I was also pleased to see that my DIY underwater connectors proved to be robust. 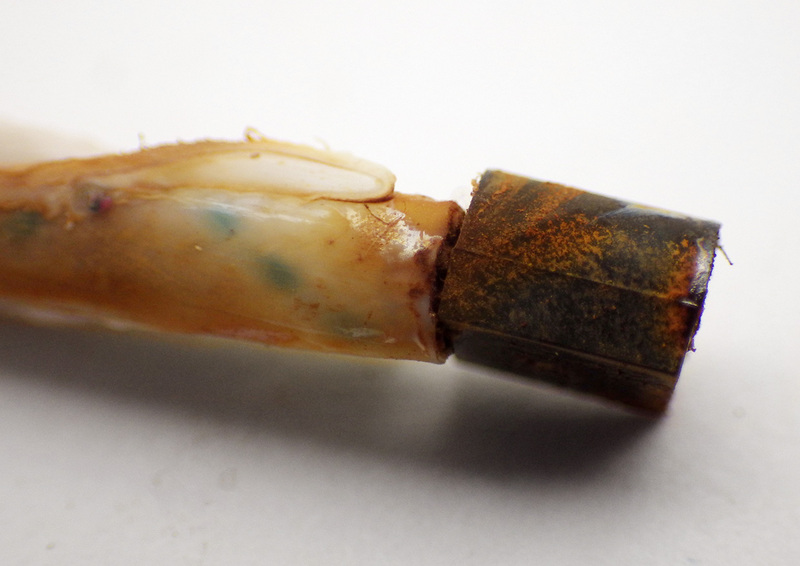 They were all were bone dry inside, with no hint of oxidation on the contacts. It was looking like we would be able to re-deploy these units right away! Damn! Even with surface barometric corrections it was obvious that the rising trend in this record was out of sync with our other water level recorders. And with 1 millibar of pressure being approximately equivalent to 1 cm of water depth, the implied 4m delta is simply ridiculous. I immediately suspected that the Qsil 216 I had put over the pressure sensor was doing something weird. I’ll need to do some homework to sort out what actually happened, but I’m guessing the silicone started absorbing moisture at depth since the stable cave environment is unlikely to cause problems from thermal expansion. #046: ready to roll the next morning. So we didn’t get a hat-trick on these first builds, but by 2 am I had new batteries in place, the clocks updated, and I had carefully peeled away the silicone over the MS5803s. (hopefully without damaging the factory gel caps). If the overnight run looked good, we hoped to install #046 in deeper cave (~24m) the next day. This entry was posted in Developing a TEMP ℃ chain, Expedition Reports & Updates on August 26, 2015 by edmallon. Give each sensor a serial number, but don’t label the sensor itself as I have in this photo or the labels will just fall off during the steam point testing. After adding crimp pins to the wire ends it becomes easy to gang them together on a breadboard for testing. Despite Maxim’s warnings, I had star configurations above 20 sensors reading well with them close together like this. I’m probably not the first person to note that sensor calibration is one of the big differences between the mountains of data coming from the citizen science movement and that produced by research professionals. (…mea culpa…) After opening this can of worms, I think I am beginning to understand why: Accuracy calibration rapidly gets complicated, or expensive, and often it’s both at the same time. By the time you have what you need to do the job, the difference between a $0.30 sensor, and a $30 sensor, is pretty insignificant. So it’s no surprise that few people work on calibration methods for low cost sensors, or why normalization approaches are used instead. But if I understand what people say about this graph, the only reason the 3 sigma spread on that graph looks better than ±0.5 at 20°C is because the errors in the sensors used to derive that curve were truly random, and had a nice Gaussian distribution around that mean. However, since the actual batch of sensors I am holding in my hand is likely from the same production run, it is subject to systematic errors that don’t cancel each other out so nicely. And since I bought them on eBay, there is also a chance that they might be fake DS18b20’s. So I could have no idea how my mean error line was related to the one on Maxim’s graph. The front temperature display on this clunky old Fischer Scientific was off by more than 2°C, and it was missing a foot. While it’s hardly a temperature chamber, the insulation and covering lid produced a slow cooling curve, so I could be reasonably confident the sensors were being exposed to the same temperatures. Don’t use data from the rapid heating cycle, because temperatures are likely to be unevenly distributed in the bath. First of all you can get rid of the bad sensors by selecting a group that has a consistent behavior over the temperature range you are looking at, with readings that fall within the manufacturer’s specifications. To get enough data for this kind of assessment, I needed to run at least 10 sensors at the same time so that the average had some statistical weight. For this testing I picked up an old five Litre isotemp bath (you can find them for $25-$50 on eBay) but you could just as easily do this with hot water in a styrofoam cooler. 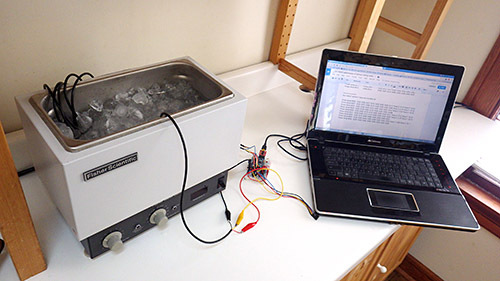 With about 20 sensors on a breadboard in a star configuration (4.7k pullup), I brought the water bath up to a stable 40°C, and then moved the entire thing out into the fridge and left it logging during the cool down. The lid was on, and I had several towels over top to make the process go as slowly as possible. It took 12 to 24 hours for each batch of sensors to reach ~5°C. 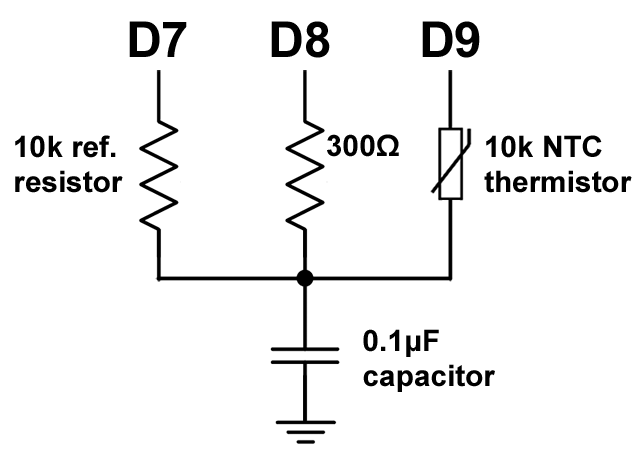 The equation you see displayed will convert that particular sensors output into corresponding temperatures on the average line. With this transformation, each sensor will yield the same reading if it is in the same thermal environment, and you can accept that any differences between two sensors in the chain represent real differences in temperature. That brought me to calibrating the DS18b20’s against intrinsic physical standards which rely on the fact that during a phase change (melting, freezing or boiling) adding and removing heat causes no change in temperature. In fact those heating curve plateaus are known so precisely that they use them at NIST to calibrate the expensive thermometers that I am trying to avoid buying. Today they do this with Gallium‘s triple point (29.7666 °C) and the triple point of water (0.010 °C), but they used to use Gallium’s melting point plateau. (29.7646 °C) Gallium sells for less than a buck a gram on Amazon and a density of about five grams per cubic centimeter means a block big enough to surround one of the DS18’s is almost within a DIY’ers budget. (100 grams will make a disk about two inches across and a quarter inch thick) But considering that commercial Ga melt cells cost about three grand, either that stuff is nasty enough to get me into trouble, or you need allot more more of it, at higher purities than you can buy on eBay to build one. Then there is the significant time it would take to refreeze the block again for every single sensor. And finally, all exposed metal must be carefully lacquered as Gallium will form an amalgam with many metals, and any dissolved metals will compromise the purity of the bath, shifting the melting point. And you would probably have to cover everything with Argon wine preserver. So I looked at the other primary standard used to calibrate pt100’s. Turns out it is possible to make your own triple point cell, and if that’s not good enough for you, Mr. Schmermund also produced plans for a freezing point of mercury cell (–34.8 °C) (See: “Calibrating with Cold”, Shawn Carlson, Scientific American, Dec. 2000 issue). However the local 7-11 was fresh out of liquid nitrogen when I checked, and I had this gut feeling that risking mercury induced brain damage was not going to pass the cost/benefit analysis either. If I actually did need sub zero calibration I think I would try using Galinstan, (−19 °C) which is now replacing mercury in glass thermometers. Pre-chilling the sensors in one corner of the bath makes the process much faster. 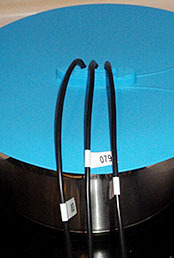 Hold the sensors by the cable, not the metal sheath, or heat from your hands will affect the readings. It was looking like calibrating against anything other than distilled water was going to take a substantial amount of effort compared to what I was seeing in the NIST and EPA videos. Most sources indicated that the ice point and steam points were at least an order of magnitude more accurate than my ±0.1°C target, making them suitable for the exercise. While the overall procedure is pretty easy, it did help to practice a few times to get a sense of when I could trust the readings. Checking that you have just the right amount of water in your ice bath makes a big difference, and don’t run the sensors at full tilt or they will self heat. (I left 15 seconds between readings) Since errors on my part would cause the sensor to be warmer than the true ice point, I took the lowest reading, while stirring, as my final reading. 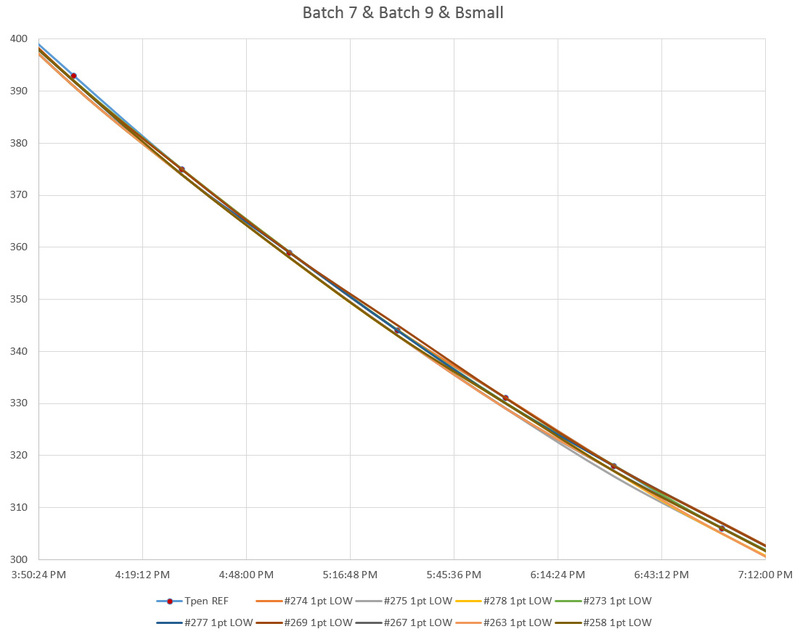 The difference between stirring, and not stirring was usually 1-2 integer points on the sensors raw output (0.0625-0.13 C) and this was consistent for all the sensors. I found a silicone vegetable steamer lid for the calibration that had three DS18B20 sized holes in it already. Getting the right pace for your slow rolling boil is important, and this lid sheds the condensed water back into the pot reasonably well. Alligator clips also help speed the process. So I moved on to measuring the steam point. Water’s boiling point is not necessarily at 100°C and the only factor that is really involved in the variance is atmospheric pressure. Altitude is often given as an alternative when pressure information is not directly available and there are plenty of places to look up elevation and barometric pressure data (& converters) for the necessary corrections. I already had some MS5805-02 sensors on hand, so with the help of Luke Millers library, I could read my local atmospheric pressure for the correction directly. The accuracy of my pressure sensor was ±2.5 mbar (similar to the more common BMP180) with the B.Pt adjustment equation being: Corrected B.Pt.=100 (°C)+((PressureReading-1013.25mbar)/30) So the 5 mbar total error range in the pressure sensor could change the adjusted boiling point by up to 0.166°C. This means that the error in my pressure sensor measurement is at least as significant as the other aspects of this procedure. Better than the default ±0.5°C, but it puts a limit on how accurate I will can get with my steam point measurement. Cutting down the stacks on the Fred steamer lid allowed me to do multiple sensors at once. This saves time, but be careful or you will pay the piper with a few burned fingers when you change them out. Each sensor took about 5 minutes to warm up to reading temperature with the water on a slow to medium boil (and it was easy to see that on the serial monitor) I didn’t consider the test done till I saw at least a full minute of stable output (reading the sensor every 10 seconds) Since errors in my technique would produce readings on the cold side, I took the highest ‘frequently repeated’ number as the final reading. Most sensors settled nicely while some of them toggled back and forth by one integer point from one reading to the next. In comparison to the steam point procedure, I trust the Ice point as more reproducible because it does not suffer from any pressure information dependency. Perhaps more important is the fact that 100°C is far away from my 20-30°C target range, leaving the possibility for significant errors if the sensors have a non-linearity problem. Another important observation is that the means generated from the uncorrected data were within 0.14-0.16°C of the means calculated after applying the two point calibration. 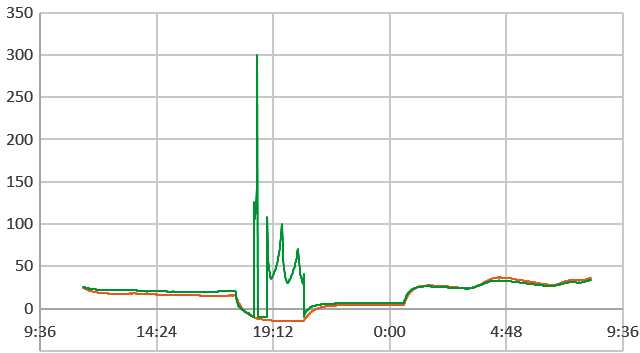 Either my sensors actually did have a reasonably normal distribution of error, or I might have missed something important. The implication in that first case is that normalization alone should improve your overall accuracy, but I still need to get my hands on a calibrated pt100 to know for sure….Argh! Bil Earl just posted a beautifully written article on sensor calibration, which puts everything here into context. A great job once again by the folks over at Adafruit! 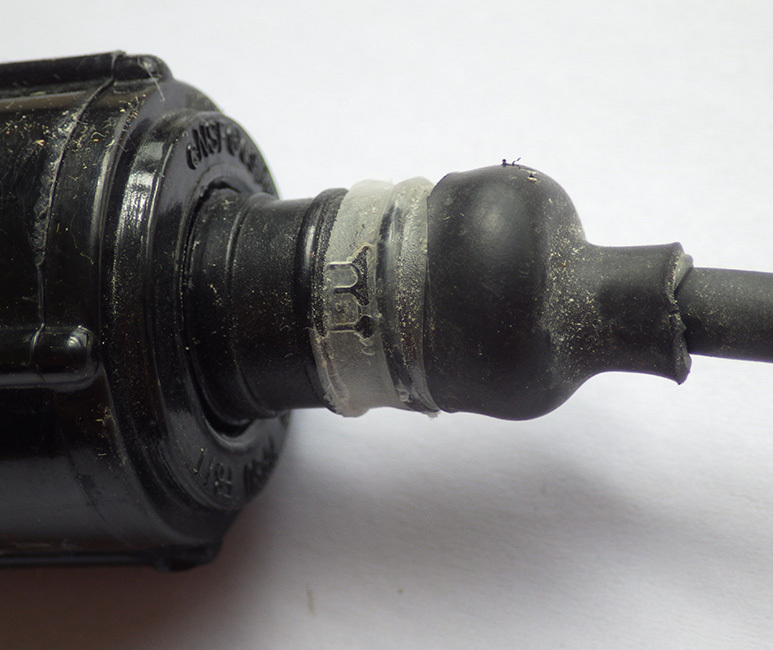 Just adding a quick link to a small post on the pre-filtering I do with these sensors, which I only posted because no one else seems to bother posting data on the ‘typical quality’ you see with the cheep eBay sensors. And after splashing out on a Thermapen reference thermometer ($200), I can try a multi-point calibration for these sensors that is closer to my target temperature range. Just put the finishing touches on a new calibration approach which, compared to this ice & steam point method, was an order of magnitude faster to do. 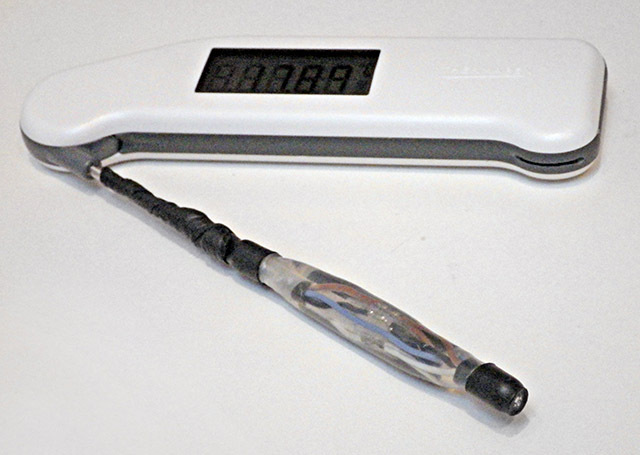 If you are calibrating a large number of sensors, the reference thermometer is definitely worth the investment. This entry was posted in Developing a TEMP ℃ chain on March 30, 2015 by edmallon.